Matt. 7 “Judge not, that you be not judged. 2 For with the judgment you pronounce you will be judged, and with the measure you use it will be measured to you. 3 Why do you see the speck that is in your brother’s eye, but do not notice the log that is in your own eye? 4 Or how can you say to your brother, ‘Let me take the speck out of your eye,’ when there is the log in your own eye? 5 You hypocrite, first take the log out of your own eye, and then you will see clearly to take the speck out of your brother’s eye. When people misuse Jesus’ opening words above to defend themselves, “Judge not…!” they are totally missing Jesus’ point. If you’re going to understand Jesus at all in Matt. 7:1, you have to keep reading. Because Jesus is assuming you’re wrong. He’s already judged you that way. Except Jesus IS the Judge. Telling Him not to judge is telling Him not to do His job, not to carry out His Office AND, subsequently, not to go to the cross and take on God’s judgment of our sin. Tell Jesus not to judge and you forfeit your only shot at heaven. Jesus’ point is not that the other person is wrong. Of course, the other person is wrong. That’s one of the easiest things in all the world to see. Subsequently, there’s nothing Christian or faithful in that. Jesus’ point is that YOU are wrong. The hardest thing in all the world to do is admit your own wrongness, confess your own sins, say to God “I’m sorry. 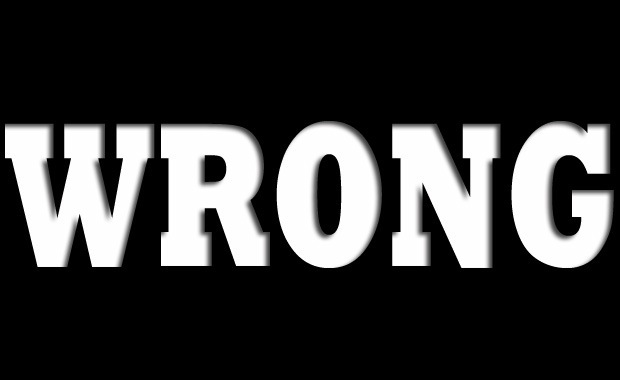 I was wrong.” This is one of the more profound ways in which the Bible defines wisdom, wearing your sin, admitting you’re wrong, confessing and being forgiven. It’s part of human nature to be wrong. St. Augustine wrote “I err, therefore I am (fallor ergo sum).” It’s also a part of human nature to be horrified to learn that we are wrong. Our day and age sees being wrong as a colossal failure. Our own memories are designed to forget when we make really bad mistakes. Sigmund Freud was going over his financial ledger one time and found the payments of a patient he could not remember ever treating. Still, the financials were there, so he obviously treated this person. After two months of thinking about it, he finally realized his error. He finally remembered that the patient was brought in by his parents complaining of severe stomach pains. His parents thought it was psychosomatic, so they took him to Freud, who diagnosed him as “paranoid.” Three months later, the man died of abdominal cancer. Freud had almost succeeded in forgetting the whole incident. He was wrong and his mind did everything it could to try to forget that fact. Perhaps it’s better to wear our own sins, rather than dwell on the sins of others. (What I mean by “wearing our sins” is simply acknowledging them, not rejoicing in them). By wearing them, we can take them to Christ’s cross and receive forgiveness. Also, by wearing them, by allowing ourselves to be wrong, we can learn so much more about ourselves than if we insist we are always right and the other person is always wrong. Always being right means living in a very, very tiny little box. It means denying ourselves wonderful opportunities at learning. It also means denying ourselves the grace of God, a grace which is for repentant, sin-wearing, sinners. “Don’t waste your time denying your sins!” Luther exclaimed. It’s wasted time away from God’s grace and it makes our time of learning in this life wasted time. God grant us the grace to be wrong! The grace to admit it. The grace to receive forgiveness for our sins and to extend it to others when they join us in being wrong.